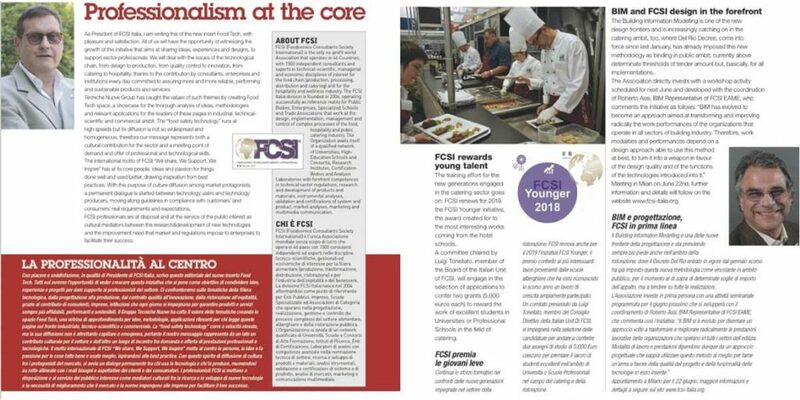 Thanks to the collaboration between FCSI Italia (Foodservice Consultants Society International) and “HA Factory”, magazine of the Tecniche Nuove publishing group, “Food Tech” was born, a special bilingual insert in which the experts and members of FCSI Italia will share ideas, experiences and projects to support the sector professionals. Therefore, starting from the April issue of “HA Factory”, readers will find in the magazine this new editorial space, dedicated to the world of professional food service to provide support on the issues – as Massimo Giubilesi, President of FCSI, writes – “of the technological chain, from design to production, from quality control to innovation, from food service to hospitality”. With this spirit of culture diffusion among the market protagonists, a permanent dialogue is initiated between those who use technology and those who produce it, moving on routes aligned with the real needs and expectations of customers and consumers. “We could say that a ‘favorable astral conjunction’ has been created to deepen a strategic Made in Italy sector, which continues to grow in the world at double digits”, commented Massimo Moscati, Editorial Director of the Tecniche Nuove Appliance Division. At this link it’s possible to read the details of the new editorial initiative.